Teen Beach Movie 2 is coming out and if your house is like ours the excitement is uncontrollable and the kids are non stop talking about the movie and how they want to have a beach party while watching the movie to make it even more fun. 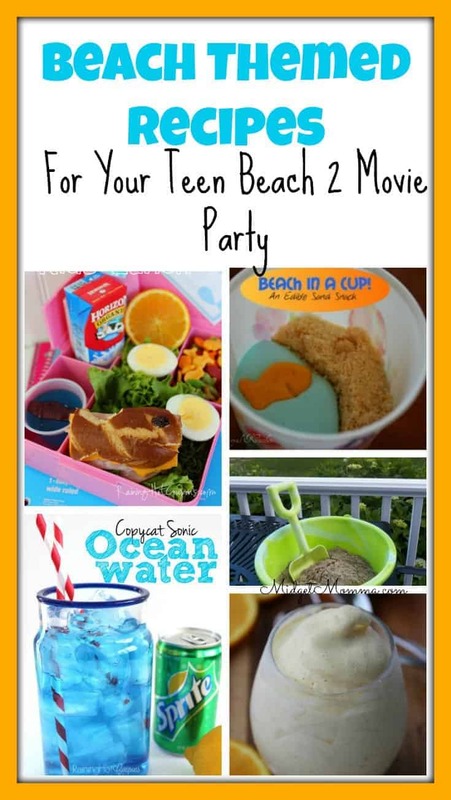 They want beach snacks that go with the fun of Teen Beach Movie 2. If you have not seen the first Teen Beach movie, watch it now (you can order it online here) and then you will be ready for when Teen Beach Movie 2 airs on June 26 on the Disney Channel! I went ssearching online to find some really awesome Beach Party Themed Recipes that will be perfect for your Teen Beach movie 2 Party! Dive in and rock out with the hottest surf sequel under the sun! Now that summer ‘s over and school has begun, Brady (Ross Lynch) and Mack’s (Maia Mitchell) relationship seems headed for a wipeout – until Lela, Tanner and the “Wet Side Story” kids show up! Dazzled by the novelty and variety of the modern world, Lela wants to stay, but the real world and the “reel” world just don’t mix. Can Mack and Brady find the magic to get the kids home and get their own romance back on track before it’s too late? Packed with electrifying song & dance numbers and hilarious fish-out-of-water wackiness, Teen Beach 2 is “wow-abunga” fun for everyone. For a fun activity to do with the kids this Coconut Scented Play dough would be perfect! Swirls Cookies – While these are “Frozen” Themed they are blue and tan the same colors as the beach!